I’d like to welcome my dear friend Velva, of Tomatoes on the Vine who took me up on my challenge of writing about the joys and challenges of having tons of Meyer Lemons in my post on Wara, Nigerian cheese curds. She wrote ‘Wara does remind me of tofu is except a more mozzarella texture. Like tofu but, not like mozzarella , wara takes on flavors which makes it so versatile. So, very cool. Without further ado – here’s Velva! In Florida most homeowners can experience the satisfaction of picking citrus from their own trees. 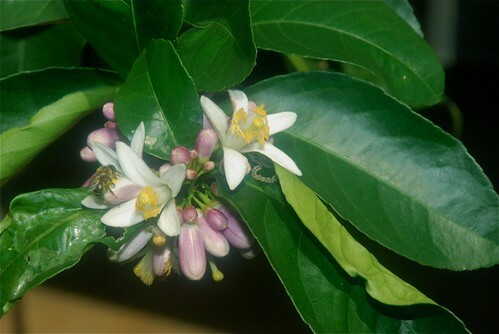 Living north of the sub-tropical climate of southern Florida the varieties of citrus that can be grown are limited. If there is one event that can be deadly to the citrus tree it is an evening of freezing temperatures. Here is the joy of the Meyer lemon, a cold, hearty citrus variety that is native to China. The Meyer lemon is a cross between a lemon, a mandarin or common orange. The Meyer lemon can thrive in my climate albeit with caution, and for that I am joyful. Would you believe I had over 100 or more Meyer Lemons this season from my single tree? I did. There are joys and sorrows when you have a bumper crop of lemons, and all at one time. The joy is there is an abundance of lemons, and I was absolutely giddy with excitement (food does that to me). The sorrow was that I was poorly equipped to handle the load. My plans were romantic and of gigantic proportions. The reality was that my time was limited. I shared, preserved, juiced, baked and cooked, still there were more lemons. I stuffed my humidity drawer in my refrigerator with my notion that I could preserve my lemons until I could get to the next big lemon project. The sorrow, I did not get to the next cooking project, and wasted lemons that could have been shared more with others, had I not been so greedy with my treasure. 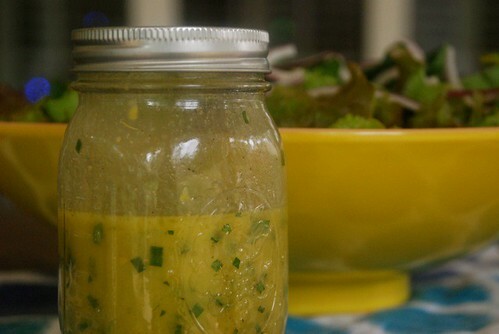 The joys were that I prepared an abundance of freshly made vinaigrettes that dressed my salad greens. I learned to preserve lemons. 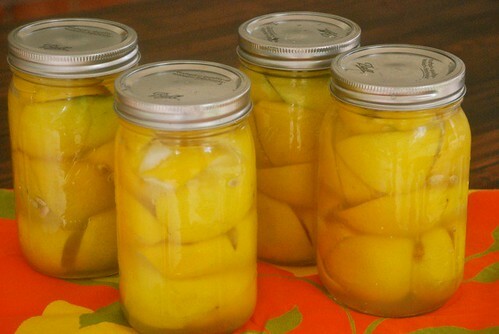 Why didn’t someone tell me sooner how easy this canning project would be- I am not sure what to do with my 20 jars of preserved lemons. I have preserved the flavor of the season for later use. For that I am impressed with myself. Soon after the lemons were harvested, during the cool evenings of North Florida’s winter. New blossoms appeared, along with the bees to ensure these blossoms will be pollinated, providing a gift from nature, for the following season. This season, my promise is to share more. I hope you enjoyed Velva’s post – I know I thoroughly did. And I totally relate with Velva’s story – loving something doesn’t mean it isn’t challenging or free from difficulties. The beauty of it is to find old ways to enjoy what we love, and new ways, new ideas for extending that love. In this case, it’s sharing. A time old, age-old tradition of giving. Just to wish you all a very happy, if somewhat belated Easter celebration. Lots of love. Visit Velva’s wonderful blog at Tomatoes on the Vine.